Wow. I hadn't expected these pictures to become matters of "historical" record so quickly! 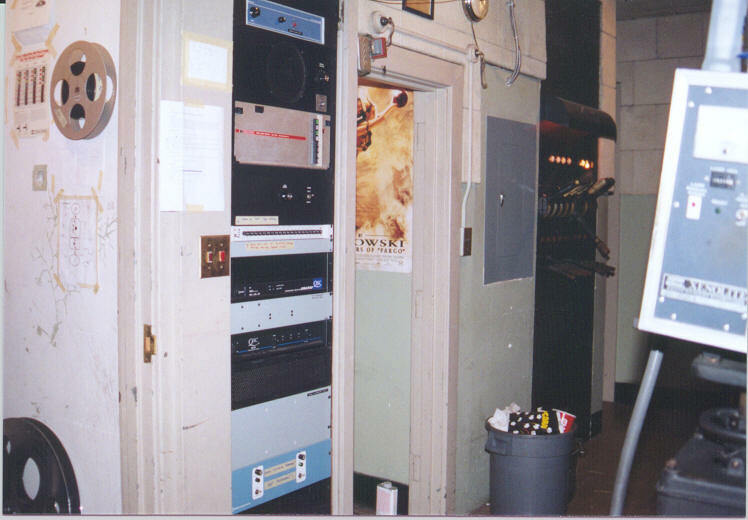 These are all photos that I took while working at the Williamsburg Theatre in Williamsburg, VA. between March, 1998 and May, 1999. 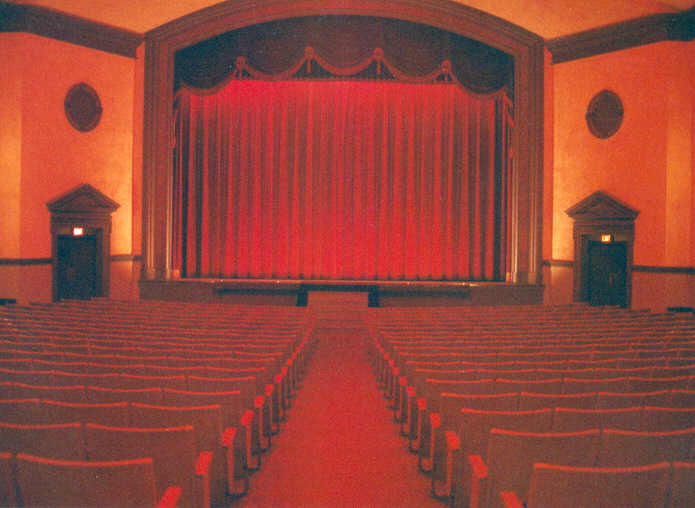 Much has changed since then, as the Theatre is currently closed for a $3m (!) renovation by Colonial Williamsburg. This web page has been around in some form since 1998, and I have only recently gotten around to updating some of the descriptions and adding more photos. 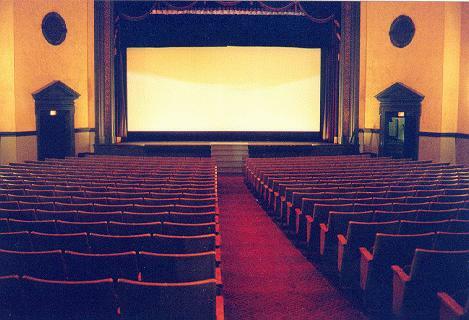 Apparently, the idea is that the main auditorium (which is pictured here) will be used primarily for live events as part of Colonial Williamsburg's programming, while films will be shown in a tiny 35-seat "screening room" venue to be located above the lobby in what was once office space. I'm not sure on the details yet, but the theatre has been closed since May, 2000 and is scheduled to re-open at some point in the fall of 2001. I will probably post more pictures and information at that time, although I am no longer associated with the Theatre in any sort of official capacity. 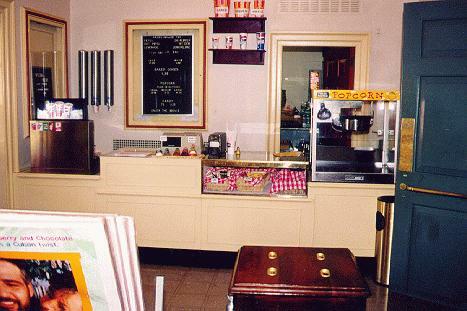 In any case, these pictures represent the theatre's appearance circa 1999, which is not substantially different from its appearance circa 1955 (with minor changes to the lobby/concession area and the booth). The photos were all scanned at different times and on different scanners, so I apologize for the varying image quality. I'll re-scan everything sometime soon. In case anyone cares, here's an old thing I wrote on the pre-show preparations for the projectionist circa May 1999. The Williamsburg Theatre was built in 1932 as part of J.D. Rockefeller's reconstruction of Williamsburg. 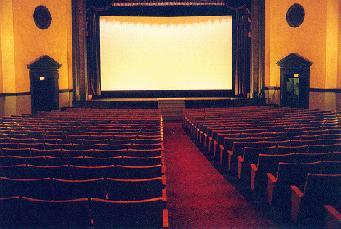 It opened it's doors on January 12, 1933 along with his other two RKO theatres, the Roxy and Radio City Music Hall. Opening night's program included The College of William & Mary Orchestra, a stage production of The Recruiting Officer, a news reel, a Mickey Mouse cartoon, a Jeeves the Butler comedy, and the world premiere of RKO's The Conquerors. The Rockefellers were such frequent visitors to The Williamsburg Theatre that the back row was reserved especially for them. 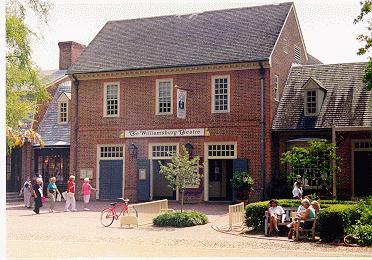 Walt Disney was also a frequent visitor to The Williamsburg Theatre and would while away the time talking with the students on the benches out in front of the theatre. projection Century MSA/2 (2 ea.) 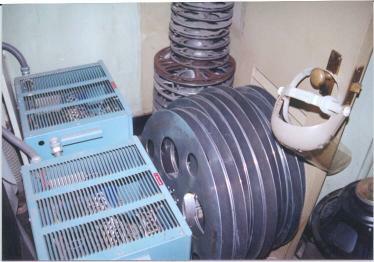 with R-3 soundheads (s/n 150 and 151); these were originally used at the Williamsburg Drive-In! Exterior view of Theatre. 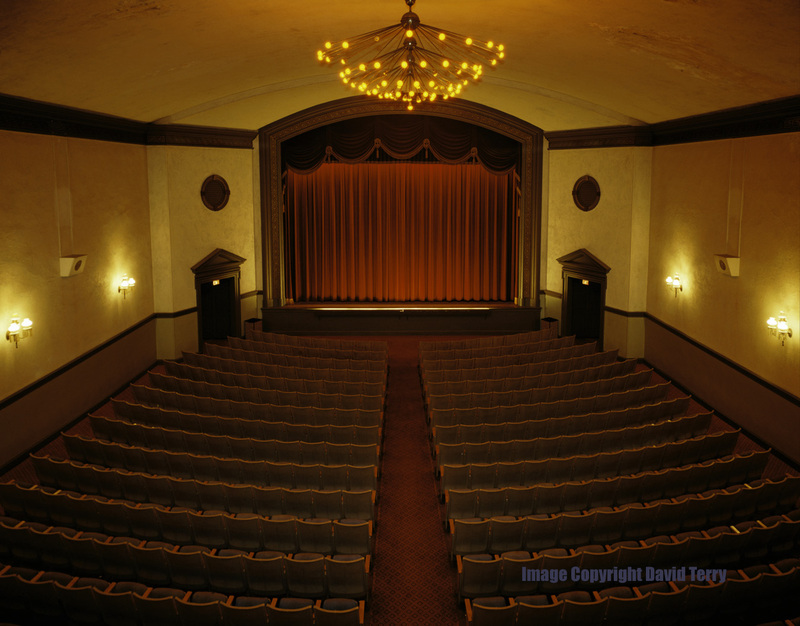 It looks much the same as it did in the 1930s and was designed to look like a colonial-era house, rather than a theatre. A poster case is located behind the small tree in this photo. The area above the doors used to be office space, but will become the 35-seat "screening room" after the renovation. Interior as seen from rear of auditorium. Curtains and draperies were original from 1933. Seats were from late 1960s/early 1970s. Masking system as installed in 1954 with both top and bottom adjustments. 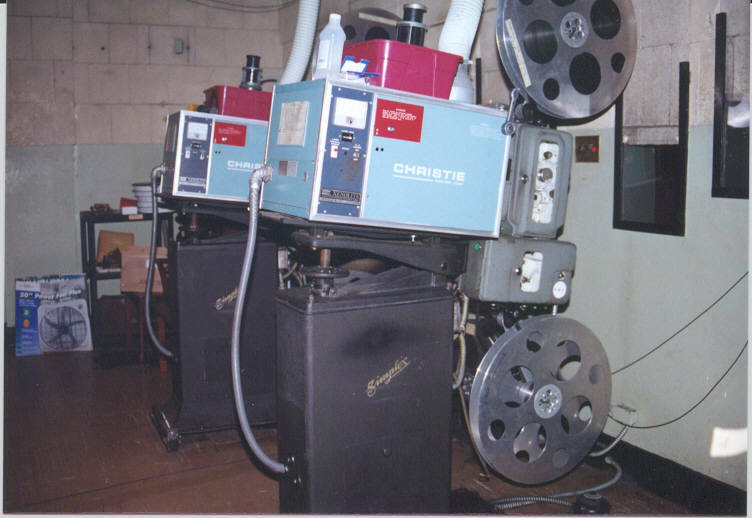 This was the "flat" configuration, which was set to 1.75:1 before 1.85:1 was standardized for non-anamorphic US widescreen. 1954 masking system again, this time configured for CinemaScope. 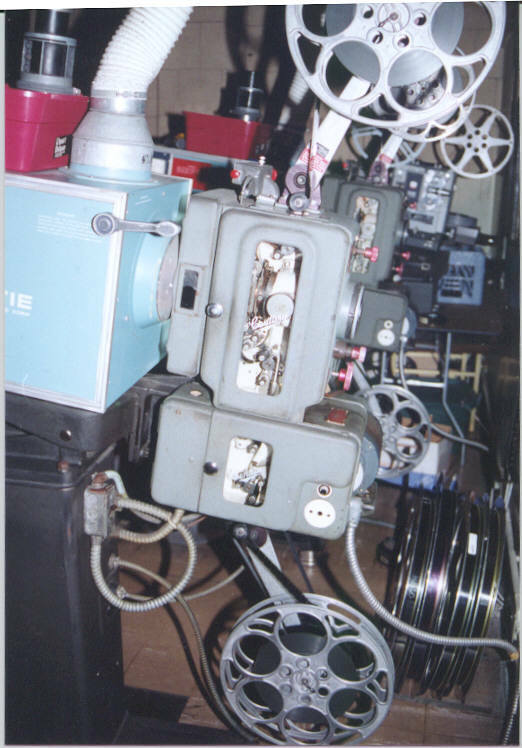 It is interesting to see that the use of top-masking for scope images goes back to the very earliest days of the format, in order to get reasonable image sizes for other formats in auditoria designed for Academy-format pictures. 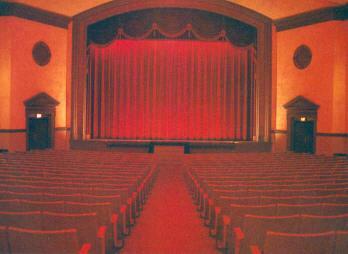 Interior as seen from the stage. 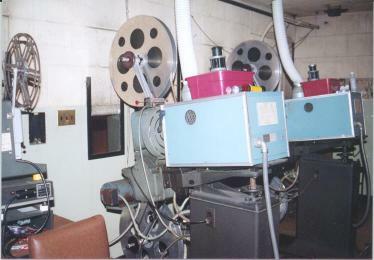 Note original Altec surround enclosures on rear wall under booth. The center-aisle configuration was original, although it will apparently be switched to a two-aisle configuration during the renovation; new (and hopefully more attractive) seats will be installed. The stairs at the back lead to the mens' room (left in this picture) and ladies' room (right). This will be changed in the renovation as well. 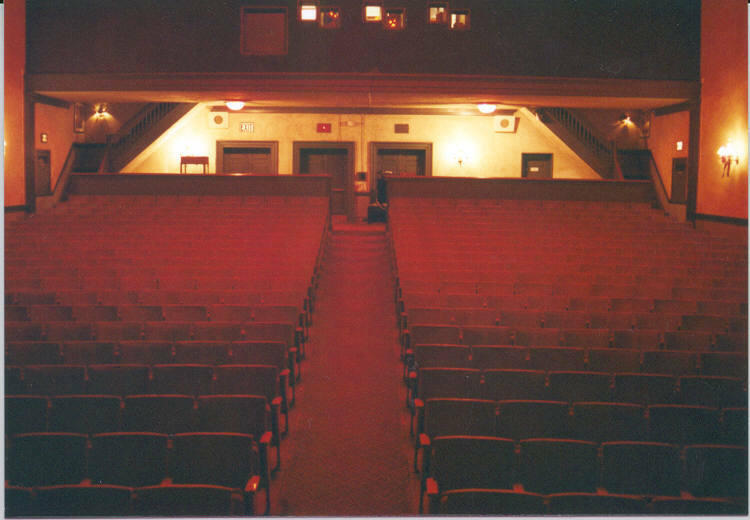 Interior of auditorium as seen from the booth. The chandelier was original and was a copy of those in Boston's Symphony Hall. 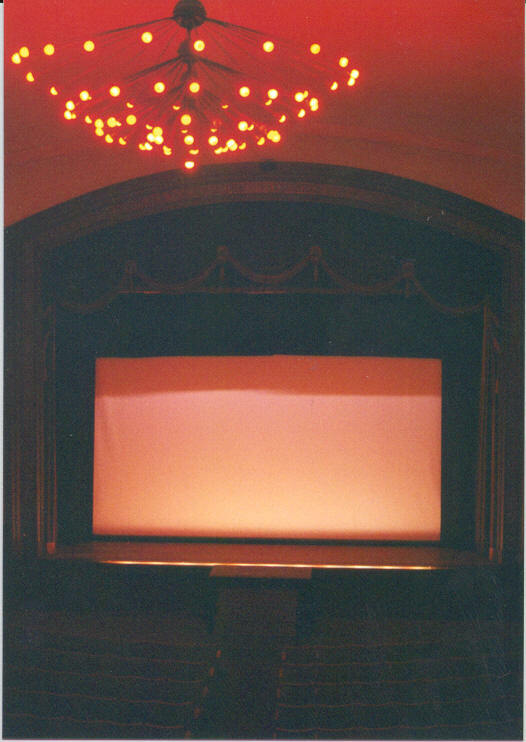 Apparently many RKO theatres from the 1930s featured chandeliers like this. The ceiling is curved and creates unusual acoustical effects. Sadly, the chandelier will not return to the Theatre after the renovation, as CW has apparently chosen to go for a more "colonial" look. Lobby interior, viewed looking toward concession stand. Note poor design, with popcorn machine and Pepsi machine on either side of cash register! Auditorium entrance door is on the right and ticket box is in the foreground. Lobby interior as viewed from behind concession counter. 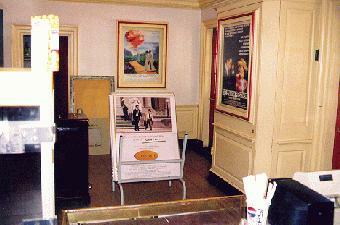 Ticket booth is to the right of "posters for sale" display, and doors to the outside lobby area are on either side of it. Janitor's closet is behind far wall. Century SA projectors, Simplex bases, Christie 2kw xenon lamps (replaced by Kneisely Xenex II 2kw lamps in fall 1999). Switches on front wall controlled the curtain motor, footpedals controlled picture changeover, and buttons on soundheads controlled sound changeover. 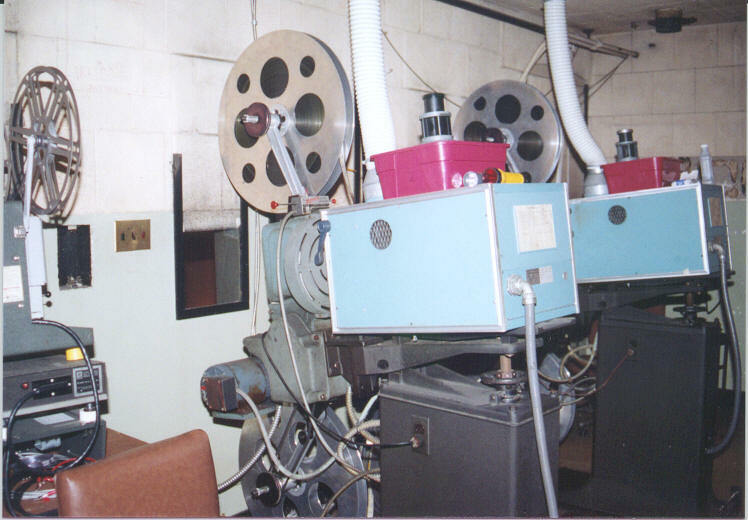 The booth was asbestos-insulated for fireproofing in the days of nitrate-base film. These projectors are likely to be re-installed in the Theatre after the renovation. 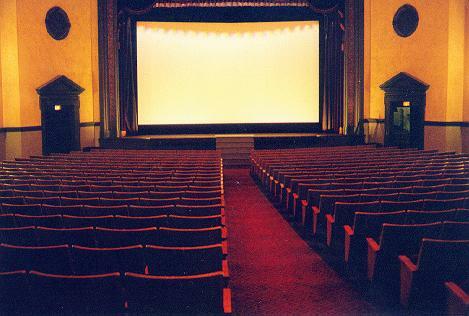 A pair of Kinoton 16/35 projectors is likely to be installed in the 35-seat "screening room." Projectors viewed from other side of booth. 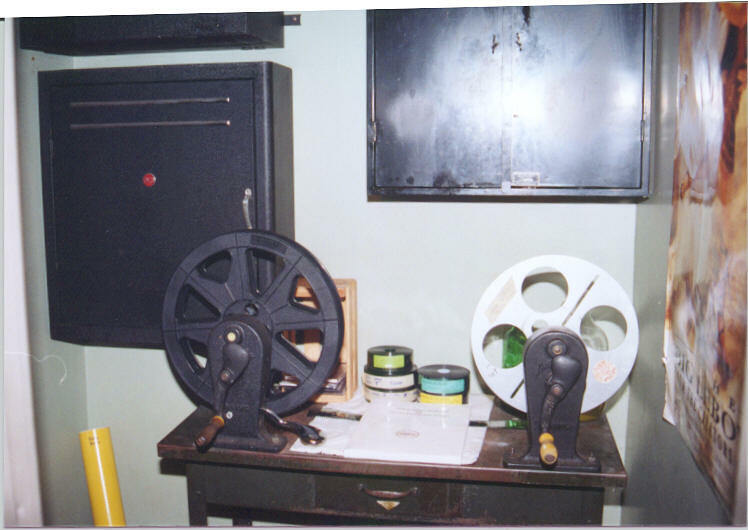 The 16mm projector is a MARC-300 Kodak Pageant. Alligator clips underneath it were needed to connect it to the sound system. Back of booth circa April 1999. 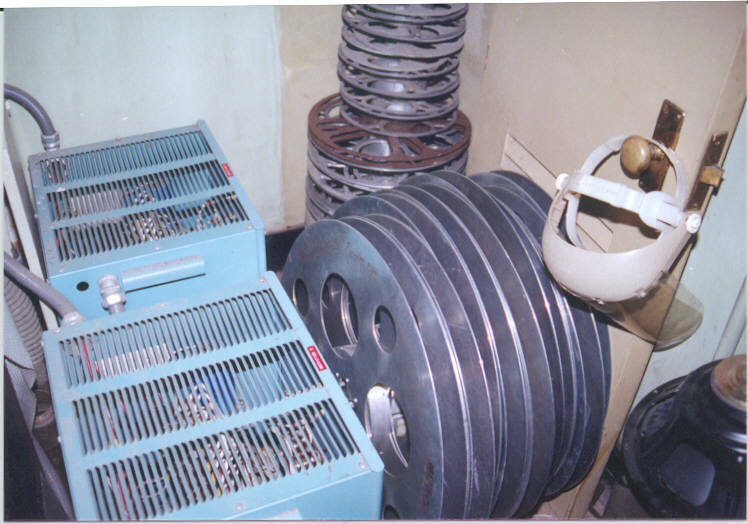 From left to right: large rewind room, sound rack, sound room with small rewind bench and spare parts, dimmer (with rectifier room behind it). As these pictures show, the booth was somewhat cramped. Large rewind bench, for 6000' reels. 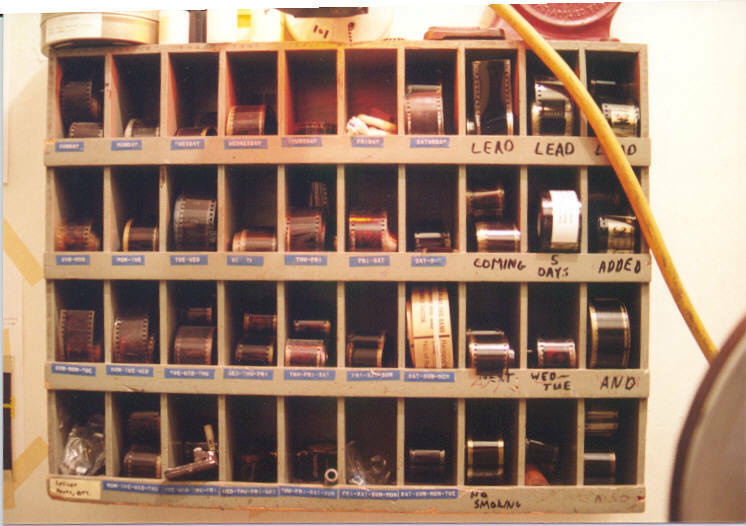 Items on the bench include: sync block (frame counter), 16mm splicer, Ciro 35mm splicer, Neumade 35mm splicer. The shelf above the bench contained old dater tags. The weird red thing on top of that is a Neumade "Safety Leader Box" that I found in the attic; it is a fireproof storage container for nitrate leader. Dater tags up close. 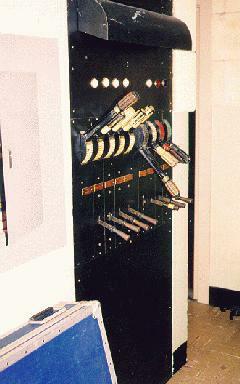 The third slot from the lower left contains a Clint Phare cue mark maker. 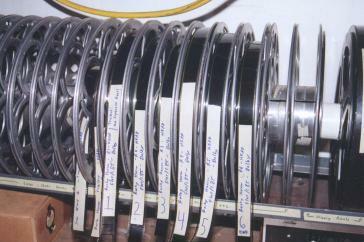 2000' reels with 1/2" shafts below the large rewind bench. Sound system circa April 1999. 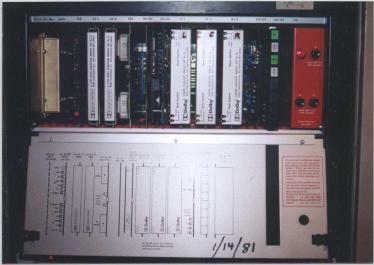 From bottom to top: Kelmar exciter supply, blank panel with sound changeover relay on back, MX700 amplifier, blank panel with 70v surround transformer on back, USA900 amplifier, EQ for non-sync, main fader, CP50, monitor speaker, monitor amp. 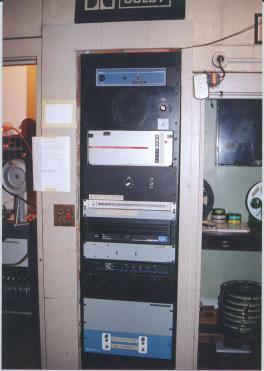 Old sound system, circa March 1998. 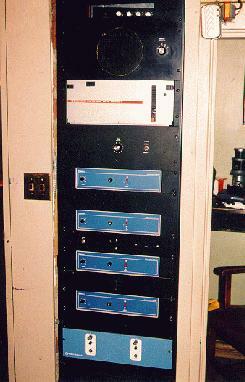 Four of these 100w McMartin paging amplifiers powered the auditorium speakers (really!). The slot at the top of the rack originally held a car radio for non-sync use, but later held an Executone amp for the booth monitor. This sort of quality installation was courtesy of Standard Theatre Supply in North Carolina (now out of business). Interior of CP-50. 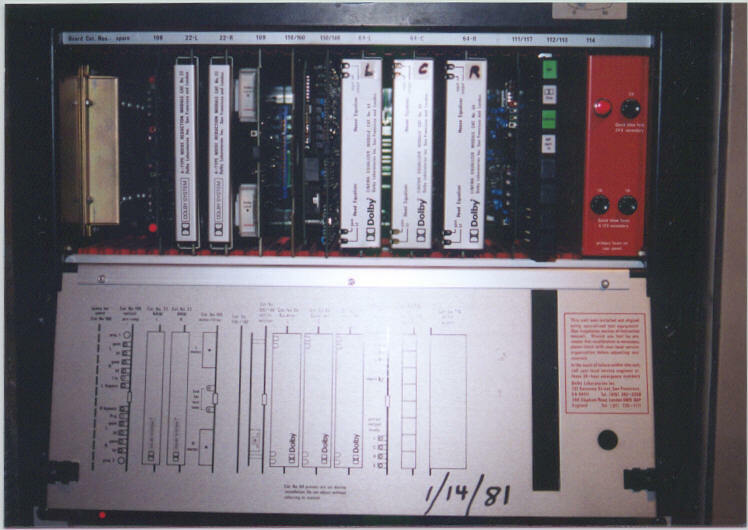 From left to right: preamp card (this was a cat. 108B), NR cards (these were Dolby A cat. 22), meter card, link card, matrix card (this was a cat. 150D), EQ cards, output card, switch card, power supply. 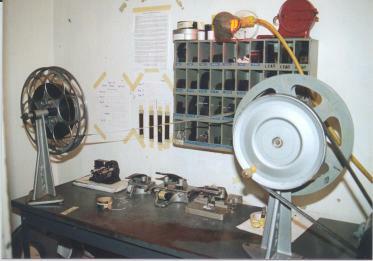 Small rewind bench in room behind sound rack. 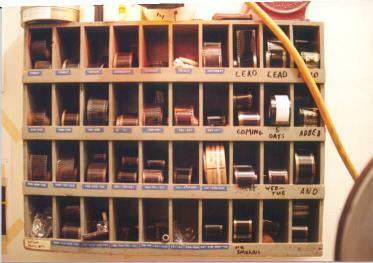 Note RCA Photophone spare parts cabinets from the 1940s! Ward-Leonard theatre dimmer panel, original from 1933. 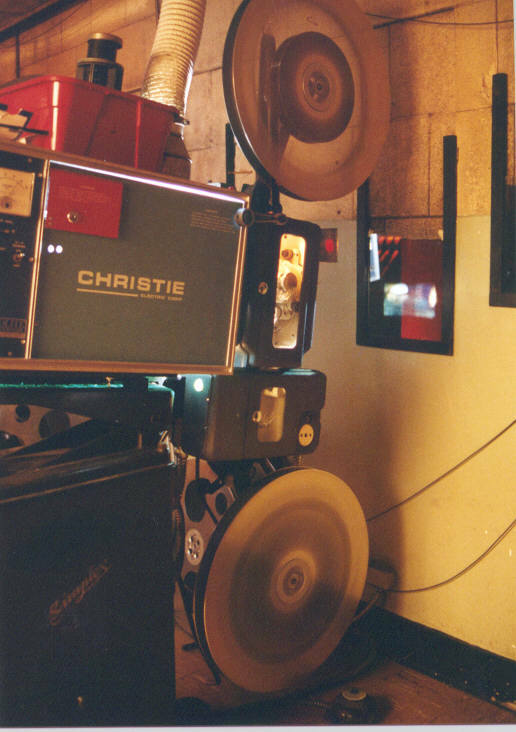 Time exposure of film running on projector #1. Projectors: 2x 35mm, 16mm, 35mm slide. Rectifier/dimmer room behind dimmer board. 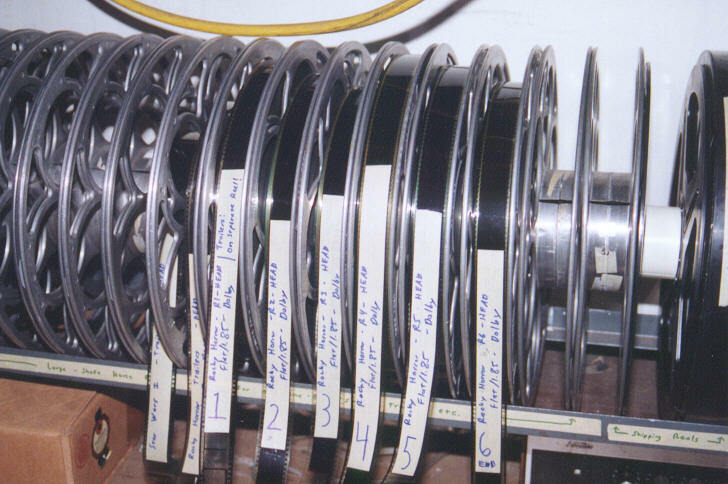 Extra large reels and facemask for changing xenon bulbs were stored here. Air conditioner in basement. This was a Carrier Model 1, original from 1933. 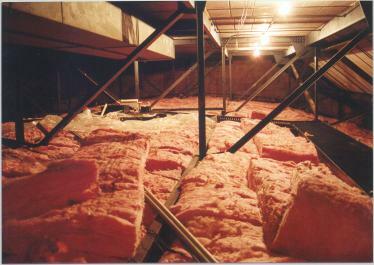 It was in use until April 2000 and was the oldest in Virginia at that time. 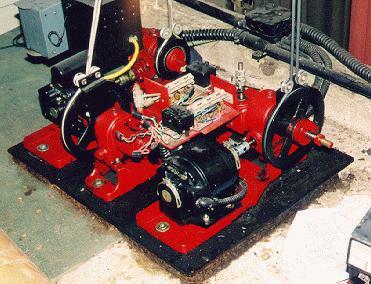 It used ammonia rather than Freon and actually worked very well, although rather inefficiently. There was no thermostat--turning it on required throwing three switches (blower, pump, and compressors) in sequence. This was just the air-handler unit; there was another room adjacent to this with the two large compressors. Pepsi machine equipment is to the right. Other weird stuff in the basement (not pictured): mounting brackets for old motor-generator sets for carbon-arc lamphouses (removed in 1982), weird electrical panels, and a room full of leaky car batteries that apparently once powered some sort of backup lighting system. 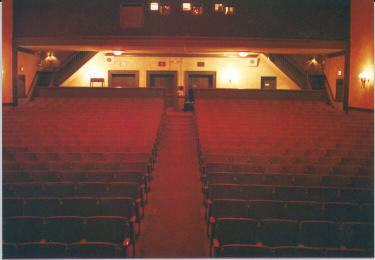 This is the attic (note curved auditorium ceiling) as viewed from the booth end of the theatre. The entrance was in the ceiling of the mens' room. The catwalk goes out to a winch (behind the ductwork in this picture) which was used to raise and lower the auditorium chandelier. It wasn't heavy, but it did take about 400 turns of the crank to lower it. Changing bulbs was a 2-hour process. There were something like 72 25-watt orange bulbs in four tiers (plus a single bulb at the very bottom). 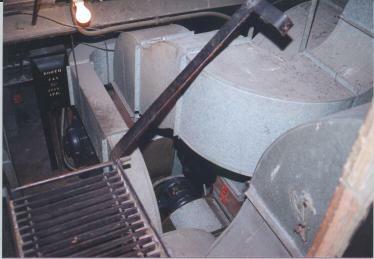 Air-conditioner blower and lamphouse ventilation system, located in attic area above the projection booth. 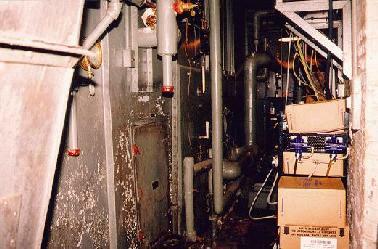 There were A/C vents above the portholes which blew cold air into the auditorium. 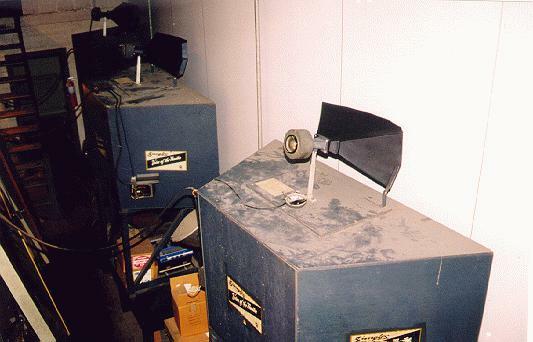 Simplex/Altec Voice of the Theatre speakers behind the screen, circa March 1998, before the (inferior) rolling screen was installed. 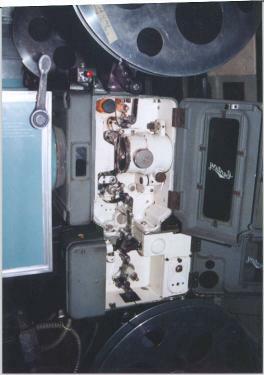 This is the original curved screen frame installed for CinemaScope in 1954, though the screen itself was replaced in 1982. We were replacing the horn diaphragm in the left-channel speaker when this picture was taken. Masking and curtain motors, on platform above stage right. Send questions/comments to snorwood@redballoon.net. Thanks!